The School Committee Nominating Panel met on September 29 to begin the process of submitting vetted candidates to Mayor Walsh for his appointment to the seats now held by Meg Campbell and Miren Uriarte whose terms expire on January 4, 2016. Both members may reapply for a four-year term. This year the Panel is required to submit its recommendations to the Mayor no later than December 7, 2015. The Mayor must make his appointments no later than January 4, 2016. The Nominating Panel is composed of thirteen members with nine being designees of parent organizations, school unions, the business community, a college or university president and the Commissioner of Education. The remaining four members are appointed by the Mayor. The Nominating Panel must submit at least three names but no more than five names for each seat and the Mayor must select one of the individuals in each group. Meg Campbell was appointed to the School Committee on January 2, 2012. She is the Founder and Director of Codman Academy Charter Public School serving grades K1-12. She is a former Boston Public School teacher and was a lecturer at the Harvard Graduate School of Education. She served as Co-Chair of the BPS School Quality Working Group which recommended steps to improve student achievement that were adopted by the School Committee. Miren Uriarte was appointed to the School Committee on February 19, 2015 by Mayor Walsh to fill the remaining one-year term of Claudio Martinez who resigned from the Committee in December 2014. She is a full tenured Professor in the College of Public and Community Service at UMass Boston. She has conducted research and written extensively about English Language Learners. 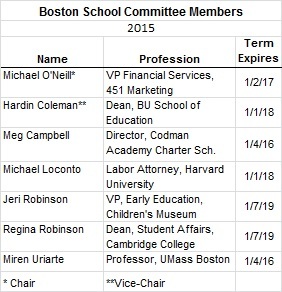 The Boston School Committee consists of seven members appointed by the Mayor. To date five members of the Committee have been appointed or reappointed by Mayor Walsh. School Committee Chair, Michael O’Neill and Meg Campbell were appointed by Mayor Menino.